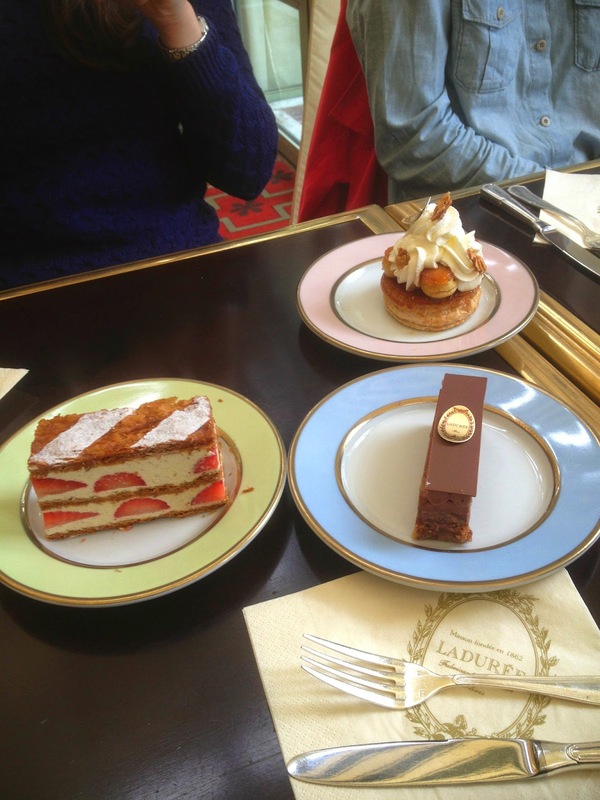 Anyone who knows me knows that I love desserts, especially exquisitely prepared and plated desserts, so it should come as no surprise that I had to go to Ladurée while I was in Paris. And a fellow dessert lover in crime (some of you may know her) happened to be in Paris that very day so that just sealed the deal. She and her friend met Jeff and me -- well, we were supposed to meet at the Arc de Troimphe, but we all randomly ended up on the same subway car, so we met on the metro on the way over to the Arc. 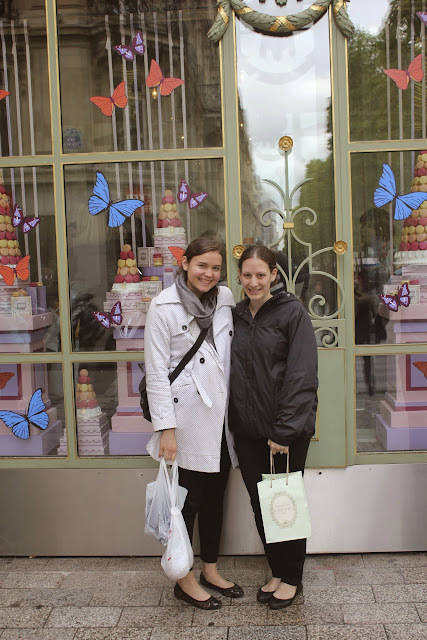 Then we all strolled down the Champs-Élysées to Ladurée. There were a couple of parties in front of us, but it didn't take long at all to get a table. We opened the menus, quickly flipping past the savory items, and spent time paging through all of the desserts before choosing four to share. 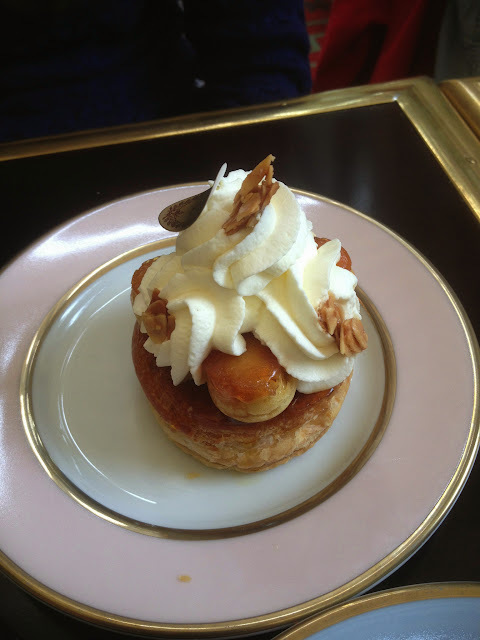 We tried the plaisir sucré, which translates as "sweet pleasure." I'd say that's pretty accurate. The dessert is a hazelnutty, chocolaty delight, with a shiny sheet of milk chocolate on top and chocolate ganache and hazelnut praline underneath. It's crunchy and silky all at once. 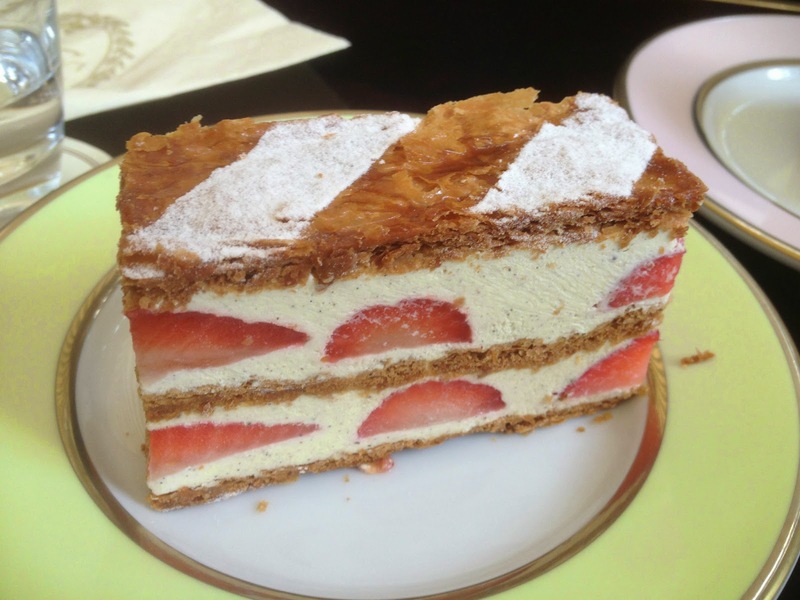 It reminded me of dacquoise, one of my all-time favorite desserts. We also went for the millefeuille fraise. This dessert with its layers of puff pastry, vanilla pastry cream, and fresh strawberries was luscious and light. The puff pastry crackled when we cut into it, and the pastry cream was some of the best I've ever had. Last, we sampled the tarte passion framboise. 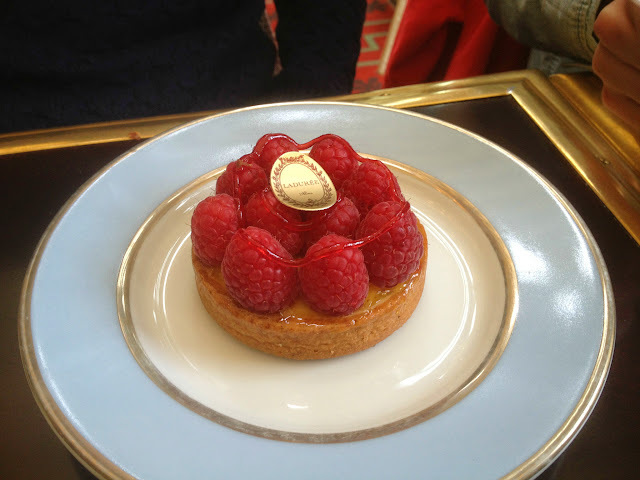 This was a lovely tart with passionfruit filling and ripe red raspberries. I love the flavor of passionfruit and really enjoyed this light dessert. 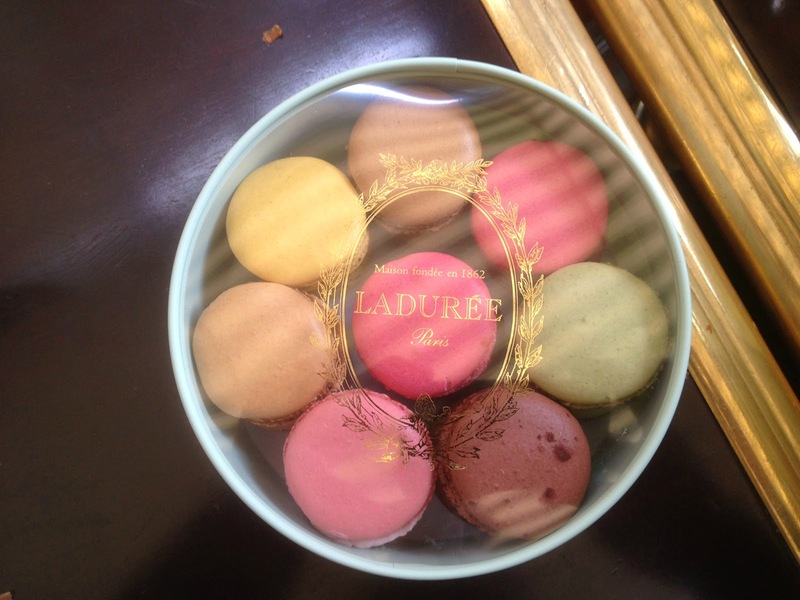 While we loved all those plated desserts, the true purpose in going to Ladurée was obviously to get macarons. The nice thing about being at a table is that you don't have to wait in the counter line for macarons. Our waiter (who was so nice and helpful) brought over a pen, paper, and the macaron menu for me, and I just wrote down what I wanted. Then someone gathered them all and filled a box and our waiter brought it back to the table. The specials were chocolate (some unusual kind that I can't remember), strawberry-mint, and yuzu ginger, so I had to get some of those. And then I went with vanilla, salted caramel, regular chocolate, coffee, raspberry, and pistachio. The one rule is that you can't eat them at the table (if you've ordered them as takeout rather than as a plated dessert), so we stepped outside before digging in. The shells were perfectly crisp and the middles soft, and it was fun experiencing the different flavors. This dessert sampling feast was one of my favorite parts of our trip. Next time I'm in Paris, I'm definitely stopping in again! I had read in several places that you're not allowed to take pictures inside Ladurée, but we saw other people doing it, so Jeff took some iPhone photos for me (I left the Canon Rebel tucked in my bag). No one yelled at us or anyone else taking pictures, so maybe that rule no longer exists. 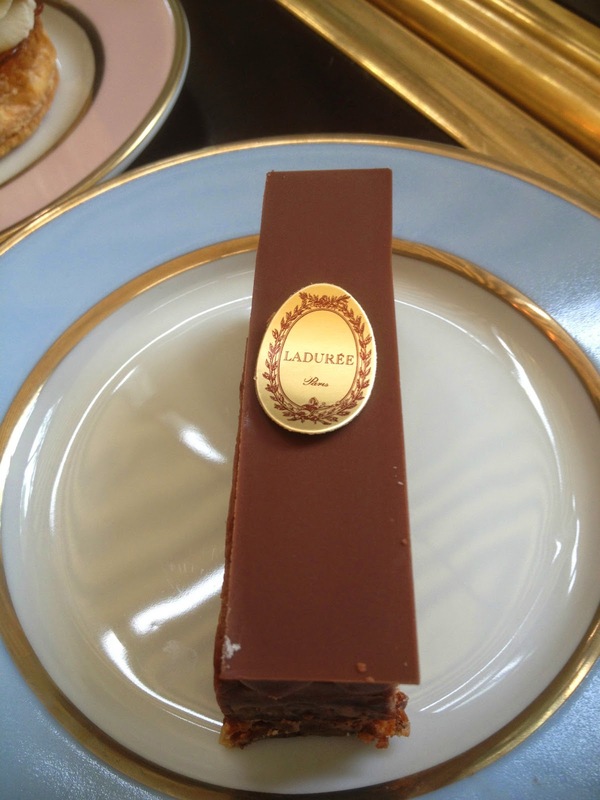 What plated dessert would you order at Ladurée? A quick note: In case you haven't heard, Google Reader is going away. To keep up with Delicious Dishings, please make sure to update your subscription. I have added buttons for bloglovin' and feedly at the top right of the page. You can quickly and easily import all your Google Reader subscriptions through either of those feed readers. 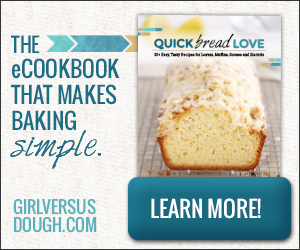 I've been using bloglovin' and really like it. There's also a form at the top right to subscribe by email. This is a great way to make sure you're seeing all of my posts. You'll receive an email each time I've posted something new.